﻿Thanks for stopping by for this weeks Play Date Cafe challenge! This week Sarah is the hostess using the colors of Brown, Silver and Grey! The PDCC would also like to welcome our new sponsor Stamp Attack! The winner of this weeks challenge will receive TWO stamp plates of their choice from Stamp Attack ($40 value) . What are you waiting for - get your stamp on and join us! This week is also my last post as part of the PDCC DT - I've enjoyed my term here with these talented ladies and wonderful sponsors! I've also enjoyed stopping by your blogs each week to see what you've inked up for the challenge. This really isn't "Sew Long", as I'll be popping back in to play along with the challenges when I can! The image was paper pieced using various papers from the Basic Grey Capella line. I also used these papers for the background which utilizes the sketch from The Sweet Stop. Here's this weeks Color Story Photo. 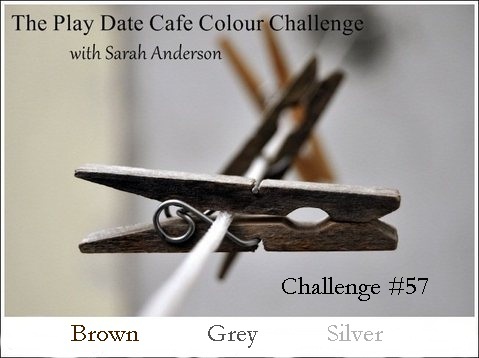 We'd love for you to play along with us at the Cafe, you can find all the details here on how to enter. If you upload to any online gallery please use keyword PDCC#57 so we can find your creations! Beautiful Vintage card Lisa! Your weekly inspiration will be missed - can't wait to see what you have in store for us :) Happy Thanksgiving! Beautiful card! Love the mix of papers and how you pieced them together. Love your title to your post too! It has been a pleasure working with you on the PDCC! 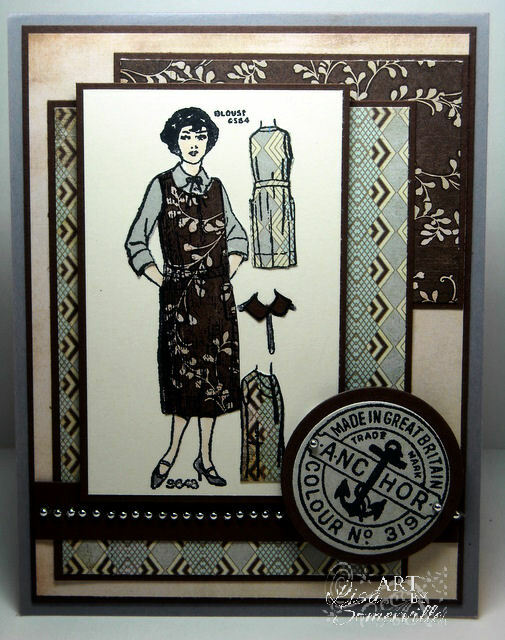 Luv what you created with these vintage stamps! Sew I'll be seein' what you create whereever you go GF! Luv your daily inkspiration. Happy turkey day! Wonderful project Lisa and such a witty title! I will miss your constant support, techie and encouragement wise. You are a super creative artist and I look forward to visiting your blog to get some great inspiration! Thank you, thank you! Wow, does your card bring back some nice memories. My Mom sewed and I learned to sew from taking an interest watching my Mom! 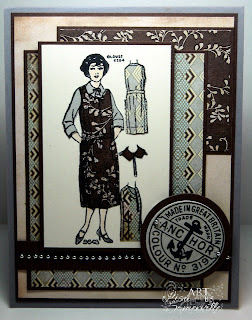 Beautiful card and the paper piecing is sew lovely! Happy Turkey Day to you and yours! LOVE that stamp! Beautiful card! Thanks for playing at The Sweet Stop! This is just gorgeous Lisa, love it and thanks for playing along with us at The Sweet Stop!